My third trip to the United States in seven months was not one that I wanted to make, due to a lot of things going on at home. However, I had a paper accepted at the 48th IEEE International Midwest Symposium on Circuits and Systems, and presenting my work in front of an academic audience was a prerequisite for the completion of my Masters Degree. The main positive was the fact that the trip was fully funded out of my research budget, and given that I decided to make the best of the situation by planning in visits to a number of parks. One scarcely needs to comment on the level of insanity required to commit to a seven hour round trip drive for a small theme park. Camden Park wasn't important enough to feature in the satellite navigation unit in my car; a search of the town of Huntington in West Virginia revealed eleven churches, six branches of McDonald's, and even a Juvenile Detention Center, but no amusement park. Driving to the general area and looking for street signs seemed like the best approach, though it quickly became apparent that there were none to be found; in the end it took me about twenty minutes of driving round in circles before I spotted my target. I decided to begin my visit with a quick walk around. It was immediately apparent that I'd arrived at a park that was a relic from a simpler time. Only a few of the attractions on site were modern, and they looked remarkably out of place among what was to all intents and purposes a living museum. 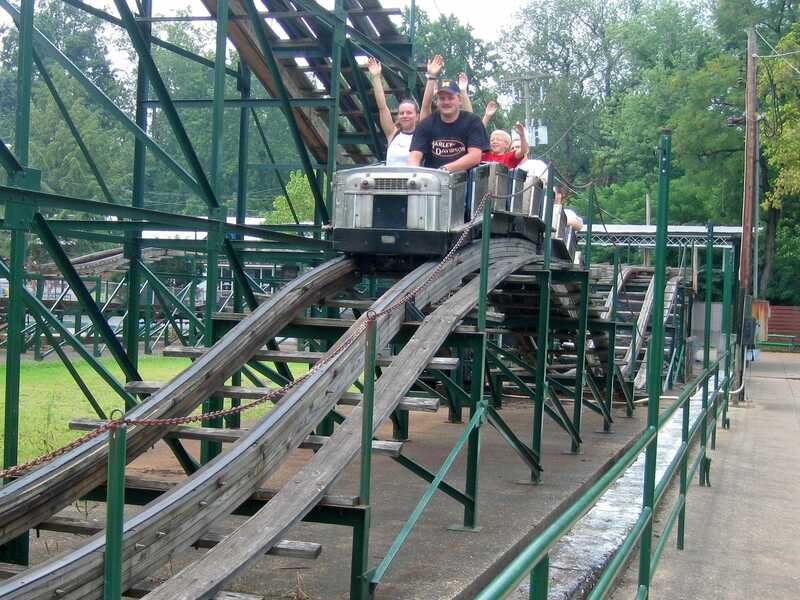 The two wood coasters were operating with National Amusement Device trains, an increasingly rare type that went out of production in the early seventies, and both were fitted with headlights. It was tempting to extend my visit into the evening so as to see these in operation, but that would have been too crazy even for me. The friendly ride operator on Lil' Dipper (#513) struck up a conversation with me, talking animatedly about not very much, albeit in the nicest possible way. The sun was hidden behind clouds, and given that it was interesting to hear him complaining about being too hot despite the temperature being a relatively pleasant 28°C. I was having no problems at all despite being used to a much cooler climate, and that set me to wondering whether all the travel I've been doing of late has made it easier for me to adjust to local weather. There was more room in the cars than I've seen on any coaster in my travels, which came as quite a surprise on a ride that could not have been more than forty feet high. Despite its diminutive stature however the layout packed a serious punch, and the track had a bounce to it that felt much bigger than its dimensions would have suggested. The experience was rambunctious but not rough in any way, and an abundance of padding left me thinking of it as an on-track version of a pillow fight, with repeated soft impacts coming from all directions. In comparison Big Dipper (#514) was a relatively sedate ride, its soporific nature virtually guaranteed by several sets of trim brakes. There was a dramatic instance of airtime on the ascent from the second drop, but that constituted the sole moment of real interest in what was otherwise a generic and easily forgotten layout. It would have been nice to ride just once without the trim brakes; perhaps that is something that might be arranged for a coaster club event some day? With the coasters complete I decided that it was worth trying the Haunted House. Much to my surprise this turned out to be powered exclusively by a chain lift, relying on gravity and momentum to return the cars back to the boarding platform. There was even a coaster style drop and ascent at the start of the layout that picked up some moderate speed for all of two seconds. In recent years some enthusiasts have decided this brief moment is enough to turn what is otherwise a dark ride as a countable coaster credit, though this clutching at straws seems more than a little silly to me. The ride operator on the Ferris Wheel was locked away in a day dream as I approached but noticed me standing at the gate after perhaps sixty seconds. He semi-apologised by telling me that his charge was the most boring in the park to operate, and it clearly was, as the only control system was a power lever connected to the drive motor. Stopping the cars at the loading platform was the only element of the job to require any skill, as there was no reverse gear, but even that looked straightforward enough. He noticed my camera in my hand as I sat down, and offered to stop me at the top for thirty seconds to take photographs; needless to say this was hugely appreciated. With that done, I completed another lap of the park, and decided that there was nothing else that I particularly wanted to ride. The log flume looked to be a generic model, and those disembarking were coming off quite wet. The prospect of a long drive in wet clothes did not appeal, and given that I decided instead to do one more lap on each coaster before heading to the exit. This park was known as Six Flags Kentucky Kingdom at the time of this visit. The ride names from that time have been left in place in this report. 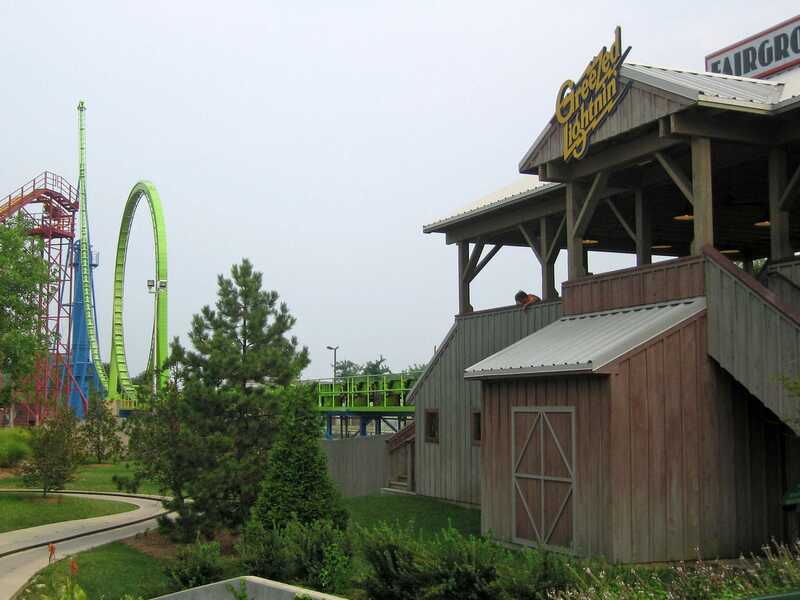 The navigation system in my car knew precisely where Six Flags Kentucky Kingdom was located, predicting just under four hours to cover the two hundred mile distance. The routing from Camden Park proved almost stupidly easy, with only a handful of instructions along the way. One of these was a requirement to leave the freeway, make a U-turn, then return to the road in the same direction, but I managed to avoid that potential embarrassment by spotting what the computer what the computer was trying to do ahead of time. That moment of lucidity knocked a full three minutes off the predicted arrival time. It was the early part of the evening when I finally arrived at my destination. The only direct cost was a five dollar parking fee, as my Six Flags season pass got me through the gate for nothing. There was an indirect cost in additional fuel, a not inconsiderable amount given a rental car that was achieving less than twenty miles to the gallon, but I figured that the prospect of enjoying a classic Schwarzkopf shuttle loop justified any expense. The ride in question had been in pieces during my last trip to the park, prompting my return; to be honest I'd probably not have bothered visiting today otherwise. The park is somewhat unusual in that it is neatly bisected by a public road, in this case part of the Kentucky State Fairgrounds. Guests cross between the two halves via a pedestrian bridge. The side with the entrance is for the most part dedicated to family rides, with the only significant exceptions being two coasters and the Hellevator giant drop, which was out of commission today. The far side has the larger attractions, including a water park area anchored by a giant wave pool. It is also, to be polite, a rabbit warren; though not particularly large its abstruse design is such that it can be a fifteen minute walk from one extremity back to the bridge. Another quirky feature of the park is its location less than a kilometre away from Louisville International Airport. The final approach path for runway 17R passes less than one hundred metres to the west of the boundary fence, and when that runway is active an aircraft passes by every few minutes with its gear down, granting magnificent photo opportunities to anyone with even a passing interest in aircraft. The location close to an airport means that there is a strict height limit enforced by the local authorities; it's safe to say that this park will not be getting its own version of Kingda Ka. I was next in line for Greezed Lightnin' when the ride broke down. Rather than wait, I decided that I'd kill some time on Road Runner Express. This proved to be a tactical error, as I was placed beside an enormously obese teenager with rancid body odour who seemed to be completely incapable of bracing as we went around corners. The retrofitted seatbelt barely stretched across us both, resulting it digging into my side throughout. It was completely impossible to enjoy the ride while being crushed under a smelly overweight blob, and I wasn't at all sorry when our lap came to an end. Rather than head elsewhere I decided to return to Greezed Lightnin' (#515), and was rewarded moments later when the ride reopened. It was great to see that the train hadn't been refitted with backup restraints, and instead featured the simple lap bar design Herr Schwarzkopf created. I took my seat in the front row, and after a brief (and efficient) check there was a short klaxon sound followed by a dispatch. The ride was every bit as superb as I'd expected, and at the risk of coming across as a total nerd (who am I kidding?) I should also say that I enjoyed the thunderous noise of the launch mechanism and the accompanying aroma of axle grease. 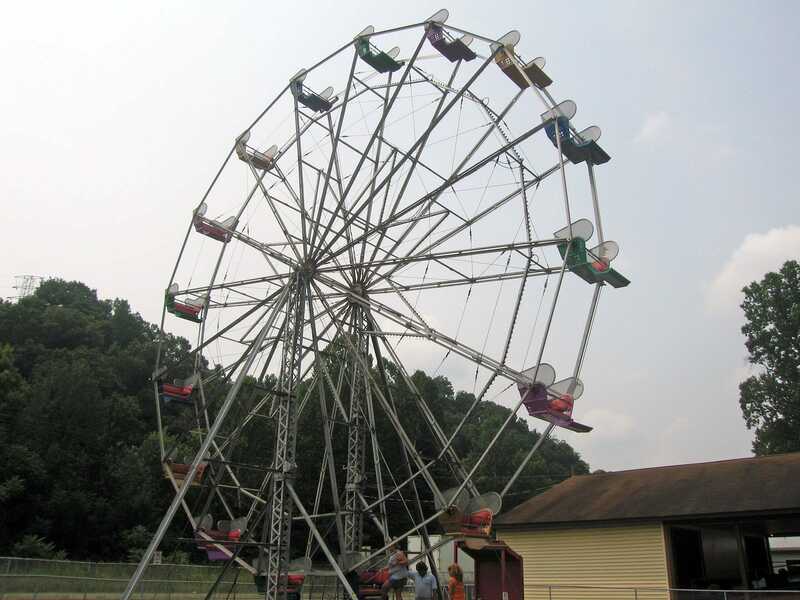 I was brought back to metaphorical earth on boarding the Giant Wheel when I heard an announcement stating that the use of camera devices on board (was) not permitted. 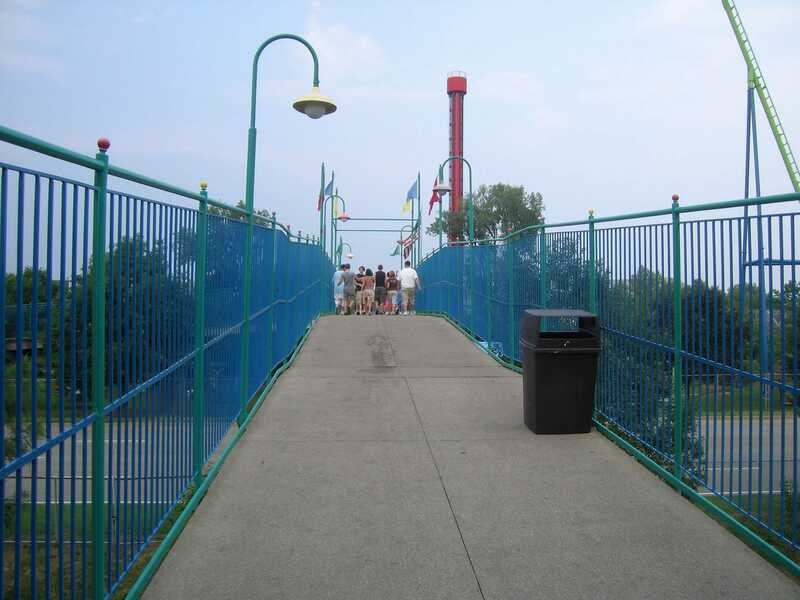 My immediate thought was that I must have heard incorrectly, but unfortunately I hadn't; management at Six Flags Kentucky Kingdom have the asinine and ludicrous decision to ban photography from a ride whose prime selling point is the view. I'd likely have chosen to abort were I not already seated; as it was, I chose to sit things out while taking comfort in the fact that I already had a selection of aerial shots in my library from a time before some numbskull thought up this bizarre restriction. My next stop was at Chang, which today featured a three quarter hour wait. During this time a grand total of five trains were dispatched, suggesting rather strongly that operations were far from optimal. Sure enough there was only one train in use, and staff were making no effort to fill it, as could be seen from the train immediately before mine which went out with six empty seats. More to the point, there was absolutely no sense of urgency about what they were doing, as they stopped at each row for a chat and slouched back to their stations in a thoroughly lackadasical fashion. The ride experience wasn't even close to being worth the wait. My seat in the second row of the train featured jarring and headbanging worthy of a twenty-year-old Vekoma, quickly forcing me to brace in the interests of self-preservation. The vertical loop was the only inversion that was negotiated reasonably well; the rest of the layout was, in a word, dreadful. Though it pains me somewhat to say bad things about a B&M, this ride was definitely past its sell-by date, to the point that I'll be glad to skip over it on future visits to the park. 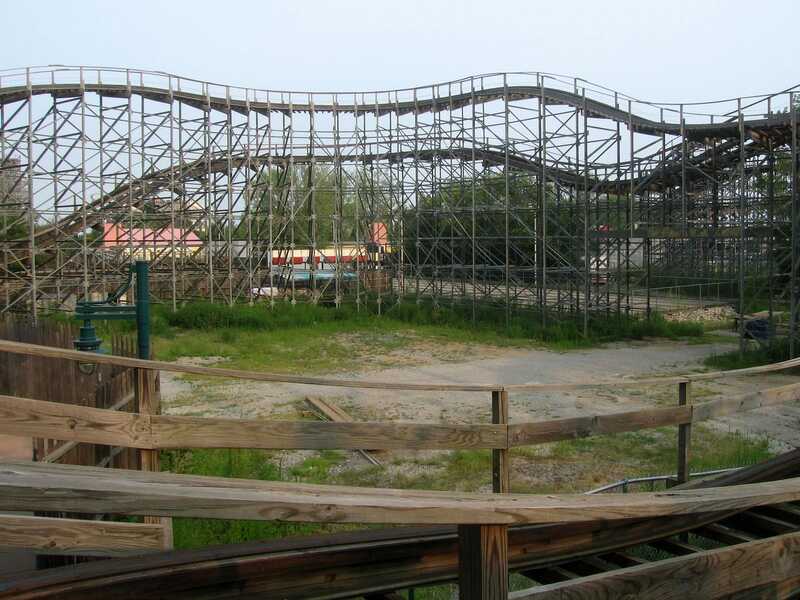 From there I went to Thunder Run, once one of my favourite wooden coasters. Today the track was in need of maintenance; though the comfort level was still good enough to ride more than once the overall experience was definitely several notches down from what it had been on my previous visit. The back car was open when I returned to the station for a second lap, but I decided it wasn't worth the bruises, and thus I settled instead for a safe spot in the middle of the train. The bizarre layout of the park caught me out, and instead of getting back to the bridge as I'd intended I wound up as far from it as possible alongside Roller Skater. I decided that I might as well ride as there was no queue, figuring that it might also shed some light on the standard of maintenance. The answer was less clear cut than I'd have liked; though the train felt faster than any of the other junior 207m models I've been on there were also several distinct bumps in the layout. Perhaps the two facts are related; after all, track imperfections tend to have more impact at higher speeds. Only the blue side of Twisted Twins was operational. The seat beside me was taken by a young child from Tennessee who had, apparently, been riding this coaster all afternoon. She informed me that the operators had been handing her all the loose change found in the train, with more than two dollars accumulated so far. I was more interested in the fact that she had been on board all afternoon; the young are surprisingly resilient, but even still she would hardly have remained on board if the coaster wasn't running well. Sure enough, the ride was running far better than I remember on my previous visit. The lack of duelling was disappointing, but not altogether surprising given the number of people in the park. The only coaster that I hadn't ridden at this stage was the prototype SLC, T2. It was on one train operation and had a substantial wait, and given the two hour drive ahead of me I decided to give it a miss and instead began heading towards the exit. This route took me past Greezed Lightnin', and as there was no wait I took a quick spin in the back seat. It seems amazing to me that people will wait long periods for an awful SLC while letting a twenty year old classic ride lie practically idle. To paraphrase a famous quotation, nobody ever lost money underestimating the stupidity of the American public.